Inter Parliamentary Union( IPU) would expand its MOU signed with Senate of Pakistan to include the guidance and patronage of the development of Model Law on effective quality control standards and codes to enhance productivity, people’s health and well-being and as well as exports. 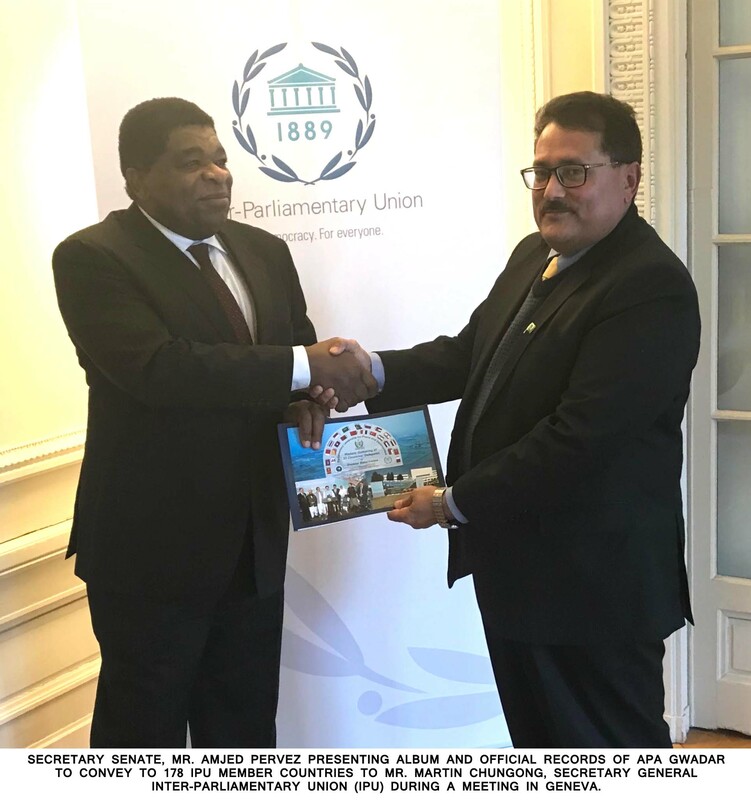 This was agreed in a meeting of Secretary Senate Amjed Pervez Malik with Secretary General Inter Parliamentary Union Martin Chungong at IPU Headquarters in Geneva. Mrs Anda Philps, IPU Ambassador/ Expert was also present during the two hour meeting. Inter Parliamentary Union (IPU) has lauded the role being played by the Senate of Pakistan in promoting the benchmarks aimed at achieving institutional excellence. The meeting deliberated on avenues of further cooperation. The IPU will propose some concrete measures and a project in line with Chairman’s passion and desire to carve out pro-active role of Parliament in development especially development of underdeveloped federation units. Secretary General Inter Parliamentary Union expressed willingness to cooperate in all areas of bilateral or mutual interest and said that there is a need to do something solid under sustainable development goals in Pakistan especially Balochistan. The visit of Secretary Senate to Geneva was in follow up of APA meeting in Gwadar in which Secretary General IPU was a special invitee. The agenda of the meeting was to firm up proposals and ideas generated at Gwadar and sunsequest meetings of Chairman Senate Muhammad Sadiq Sanjrani with him in Male’ and Azerbaijan to spread message of peace, connectivity, inclusivity and sustainable development discussed , debated and exhibited in Gwadar to 178 member countries of IPU. The Secretary General IPU emphasized on a close and enhanced coordination between Pak Parliament and IPU in capacity building, technical support and orientation of members. Both the sides also agreed to cooperate for taking the Legislative drafting facility established in Senate under MOU with IPU to higher level and standards. The IPU Secretary General also called upon the need to build regional inters parliamentary synergy between IPU and APA. As Secretariat of IPU Asia Pacific Group (APG) will be with Parliament of Pakistan this year, both side also discussed ways and means for better organising and secretarial support before, during and after the next two IPU Assemblies in Doha and Belgrad.